Michael Williams watched a lot of film over the summer to make himself better, and the coaching staff turned to a former rival for motivation this week. Find out about that in more in tonight’s notebook. Here are the key notes from the media guide UA handed out prior to Alabama’s first ever meeting in football with the Florida Atlantic Owls. Streaking: Alabama has scored 94 unanswered points dating back to the third quarter of the Michigan game. 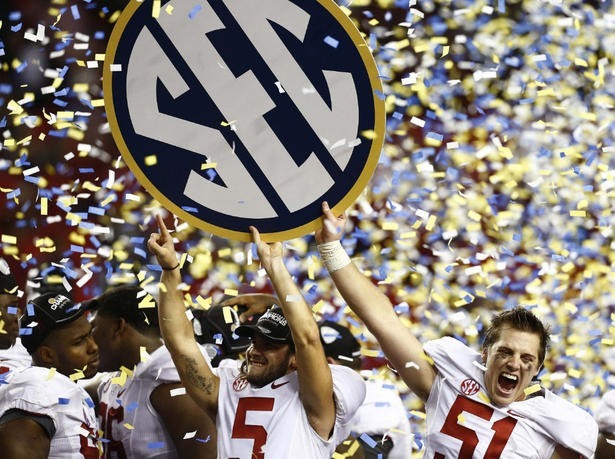 Been There, Done That: Alabama has eight players that saw action on both the 2009 and 2011 national title winning teams, including three players that started at least two games in both seasons: Barrett Jones, Michael Williams and Nico Johnson. Damion Square, Jeremy Shelley, Carson Tinker, Chance Warmack and Robert Lester also saw action in both seasons. Week In, Week Out Fixture: Chance Warmack, Carson Tinker and Robert Lester are tied for having the most consecutive starts, all at 29. Other notables include Cade Foster at 28, D.J. Fluker at 19 and AJ McCarron and Damion Square at 16. Drawing Connections: While this is both Alabama’s and Saban’s first time facing Florida Atlantic (as a head coach), Saban does have experience in nonconference games against teams from the state. 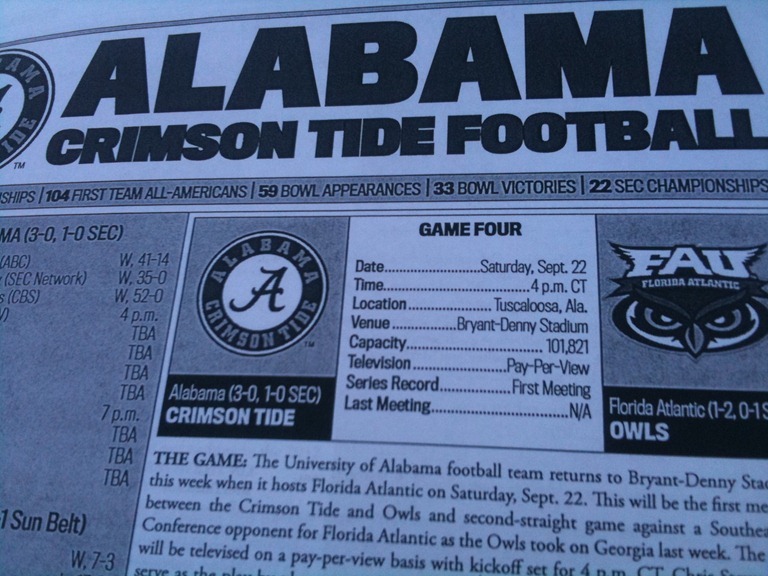 Alabama beat Florida International 40-14 in 2009 under the direction of Saban. His first year with the Tide also featured a 21-14 loss to Florida State. Alabama hasn’t returned a kickoff for a touchdown since Trent Richardson did it at Duke in 2010 on a 91-yard effort. No Alabama player has rushed for 250 yards since Shaun Alexander did it in Baton Rouge in 1996. No player has rushed for 250 against Alabama since Bo Jackson had 256 in the 1983 Iron Bowl. 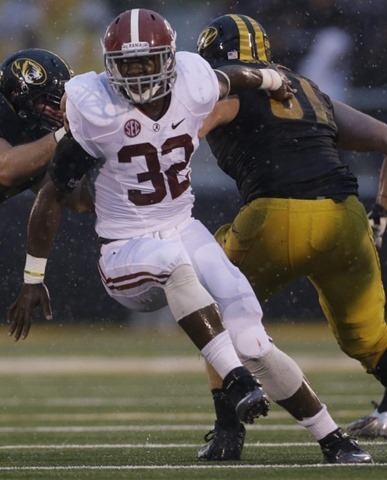 Neither an Alabama player nor an opposing player has ever rushed for 300 yards. Follow the Leader: C.J. Mosley leads the team with 23 tackles, 15 of them solo efforts. The Alabama coaching staff recognized runningback T.J. Yeldon, tight end Michael Williams, linebacker C.J. Mosley, cornerback Dee Milliner, punter Cody Mandell and wide receiver DeAndrew White as Players of the Week for the previous game against Michigan. Yeldon rushed for 111 yards and a touchdown on 11 carries in his college football debut. 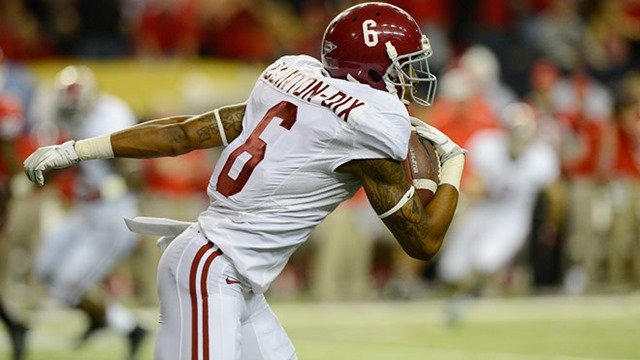 Williams hauled in the game’s first touchdown pass from AJ McCarron. It was his only catch on the night, but the coaching staff also recognized his blocking ability that paved the way for backs like Yeldon. Defensively, Milliner added this honor to his national and conference defensive player of the week awards. Milliner had a career-high four pass deflections and five tackles to go along with an interception that was returned for 35-yards to the Michigan 17-yard line. Mosley led the team with seven tackles and also returned an interception for a touchdown. Mandell averaged 47.0 yards per punt in his four punts with a long of 59 and two of the falling inside the 20. White was credited with one special teams tackle and as a key member of the team in forcing two fair catches.